A world premiere of AI-generated symphonic music! All three audio files are compiled from two live recordings with different microphone settings. The cover image is generated by algorithms trained with the following image searches: migration, mediterranean, boat, Libyan coast, EU. Different search engines were used. 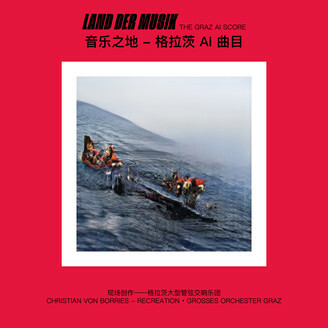 »Land der Musik« celebrated its world premiere on 7 October 2018 at steirischer herbst ’18 – volksfronten in Graz, Austria. Commissioned and produced by steirischer herbst in cooperation with ORF Musikprotokoll. A new standard of beauty. Artificial intelligence (AI) algorithms can now group photo pixels or audio waves into meaningful categories. This is similar to how our brain operates, yet the outcome seems distinctively non-human. At the same time it appears that the sphere of our appreciation and imagination may just have expanded. The question of whether we are still able to see and hear the difference between automated and so-called autonomous artifacts should be left to historians. On the other hand, producing this analog audio record with this image on the front cover really is an antagonism. A more appropriate medium might be a tracking chip of your online and offline activities generating customized results in real time—be it images, music, or whatever. If AI is communist (to quote the libertarian Silicon Valley entrepreneur Peter Thiel), then this statistics-based technology might actually reinforce centralized monopoly capitalism and the coming crisis of inequality, just as it might accelerate into Deleuze’s notion of the Society of Control. But it might also be seen and heard as a demo, a new standard of beauty, for the redistribution of wealth and for solidarity; in short as a utopia freed from exploitation, nationalism, and racism, liberating us from our own perception of this world. »Land der musik – The Graz AI Score« demonstrates how machine learning might help us to finally create the perfect Austrian national music identity. Yet in doing so, our ultimate aim is to get rid of the construction of national identities all together.